(Wikipedia) ... To prevent the advance of Confederate troops across the river from the Wrightsville (York County) side during the Civil War, the bridge was burned by Union militia under Maj. Granville O. Haller and Col. Jacob G. Frick on June 28, 1863. Civilian volunteers from Columbia had mined the bridge at the fourth span from the Wrightsville side, originally hoping to drop the whole 200-foot (61 m) span into the river, but when the charges were detonated, only small portions of the support arch splintered, leaving the span passable. As Confederates advanced onto the bridge, Union forces set fire to it near the Wrightsville side. Earlier they had saturated the structure with crude oil from a Columbia refinery. The entire structure soon caught fire and completely burned in six hours. 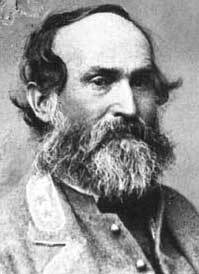 Confederate generals Jubal A. 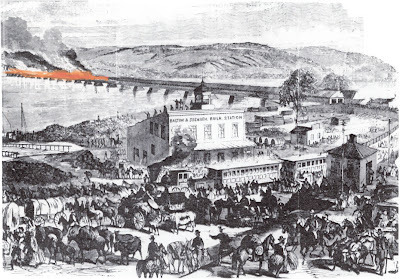 Early and John B. Gordon had originally planned to save the bridge despite orders from General Robert E. Lee to burn it, and Union forces under the command of Colonel Jacob G. Frick had burned the bridge, originally hoping to defend and save it. Afterwards, the Columbia Bank and Bridge Company appealed to the federal government for reimbursement for damages incurred from the bridge burning, but none were ever paid. Conservative estimates put the cost of damages with interest today at well over $170 million.